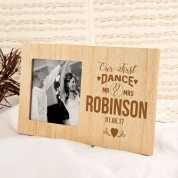 Our pretty wooden photo frame is a beautiful keepsake to display a snapshot of that all important first dance. The newly Weds will love to display it in their love nest and it will look stunning wherever it sits in the home, with a simple design engraved in to the wood. 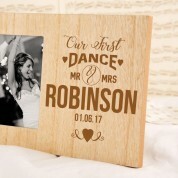 The design features the wording “Our First Dance”, followed by the couples surname. The wedding date is also included, and the typographic design is made complete with a love heart and pretty motifs. As well as a Wedding gift, we think our frame would also make a wonderful anniversary gift for couples old and young – they will love to reminisce on such a special time. Our professionals work in house to carefully engrave onto the wood for unique results every time. 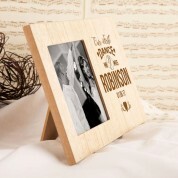 The frame features a small square photo window - perfect for an Instagram snap of the special day!